Is biohacking mental illness even possible? 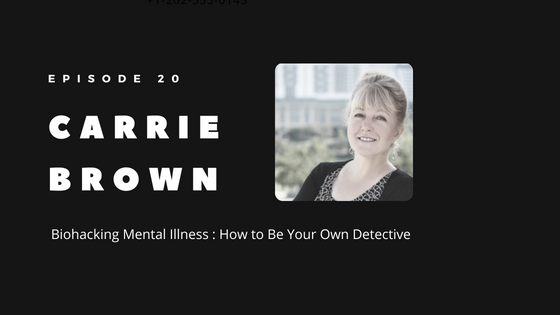 In this podcast episode, learn how Carrie Brown became her own detective to heal her mind and body using her “seek the tweak” approach and how she used keto for bipolar to optimize her health and live her best life. Listen to Carrie talk about her experience with Bipolar II Disorder and how she has biohacked mental illness through tracking health data, a keto for bipolar diet, MTHFR support, supplements and lifestyle changes. Now completely medicine-free, she maintains a healthy mental outlook by understanding what her body needs and how to support it. If you’ve ever felt even a little bit of that darkness, you know that it isn’t something you can talk or will your way out of. Your body is literally starving for what it needs, and while a pharmaceutical may be necessary to help you while finding your root causes, you do not have a medication deficiency. It is Carrie’s hope that her story inspires you to take control of your own health, to be your own detective, in the knowledge that she believes there is a fix for you, to know there IS light at the end of the tunnel. Carrie Brown is a former-professional-pastry-chef-turned-keto-cookbook-author, recipe developer, keto advocate, motivational speaker, and podcast co-host of Ketovangelist Kitchen. She is also part of Ketovangelist Unlimited (a membership for people who are serious about keto, who want to take it to the next level). You can find her here: Carrie Brown-Life in the Sane Lane, Facebook, Twitter, Pinterest, Flickr, and Instagram. Listen to her inspiring story and know that you are not alone. Suicide is a very real subject and anyone having suicidal thoughts should call the National Suicide Helpline at 1-800-273-8255. Ask for the help that you need. If you know someone struggling, reach out to them. You may be the lifeline that they need.